Honestly, I'm thinking I was expecing more from E.Z. Rider's sophomore effort Long Way from Home. They have improved over 2008's totally DIY debut Experienced Zydeco Riders, at least in their image; Long Way from Home is packaged quite well. However, I'm wondering if they shouldn't have invested more in their production. To my ears, Long Way from Home still sounds a bit flat, and could possibly fall flat except for the power of the music. But the music is what makes the E.Z. Riders so good, and my ears so forgiving. Once more they venture into American style blues and country inspired rock, with more emphasis on the former it seems. The overall atmosphere is relaxed and assured as reclining on the banks of the Mississippi on a late July evening with some sour mash. Alessandro Alessandrini (guitar, vocals) once again shows immense talent coaxing some riffs and licks that would make anybody from Buddy Guy to Dickey Betts to Clapton and Gallagher happy. Long Way Home can remind of Clapton; both What It's Worth and Far Away like the Allman Brothers; and, Let Me Be Your Man like a merger between the Bakersfield and Gainesville sound. (The harp work from Carlo de Signoribus adds real color to this song.) Of more importance is the simple fact that the E.Z. Riders are getting more technically proficient, trying more expansive and unpredictable maneuvers, as found on Dangerous Behavior or To Save Myself. And I think Alessandrini may be becoming a better singer. So, in the end, Long Way from Home is an advance over their previous work, showing both growth and maturity. Yet, I still think a crisper, cleaner, production and mix would truly make the songs 'pop' and do the band greater justice. Very recommended. E.Z. 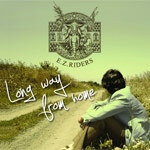 Riders's Long Way from Home is an advance over their previous work, showing both growth and maturity in their classic blues rock style.